OMG, Jack asked Hannah on a new date! Help her get ready for a beach date with her high school crush Jack. Turn Hannah into a beauty queen with tons of makeup tools, fancy summer hairstyles and fashion clothes! Hannah's boyfriend Jack plans a romantic date at the beach. Hannah is very excited and needs your styling skills to look like a beauty queen tonight. 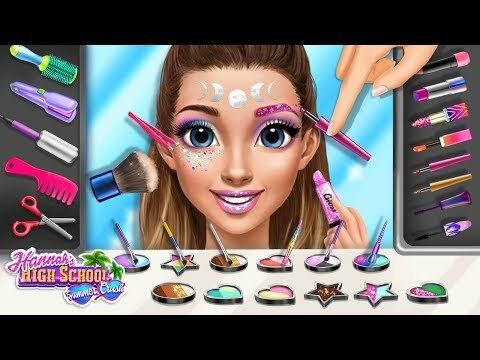 Join the makeover squad with Hannah's best friend Jessica, create stunning makeups, colorful hairstyles and amazing outfits. Get the hottest summer crush game for girls, enjoy new beauty makeover adventures, style, design and become a part of a high school love story. Play now and find out if Hannah and her boyfriend Jack’s romantic beach date ends with a kiss! · Follow Hannah and her high school crush Jack's love story to the seaside this summer! · Help Hannah become a beauty queen on a romantic beach date with her boyfriend Jack! · Do the flawless makeup, style hair and polish nails at the beauty salon with Hannah's best friend Jessica! · Mix and match fashion dresses and accessories for the hot summer look on a beach date! · Meet Jessica's new boyfriend JP and have fun at the beach party with friends! · Set up a magazine cover photoshoot and become a superstar this summer! · Learn new dance moves and dance with Hannah and her boyfriend Jack all night long! · Pick a perfect swimsuit, sunbathe and have a refreshing swim in the sea with Jessica! · Play beauty makeover games every day, collect coins, diamonds and unlock new levels! · Watch rewarding videos and get bonus coins for exciting game items! Crafted and play-tested, TutoTOONS games foster people’s creativity and help them learn while playing the games they love. Fun and educational TutoTOONS games strive to bring meaningful and safe mobile experience to millions of people worldwide. Discover More Fun with TutoTOONS! by Silicon Sisters Interactive Inc.